When I lived in Melbourne and worked in some of the inner suburbs I often saw some amazing graffiti. Some of it I’d classify as Art. Now I differentiate this type of graffiti from the simplistic "tagging" where the person sprays a basic signature multiple times in an area, sometimes over the top of much better work. I saw this particular piece of ”art” while walking down Montague Road past some of the more rundown industrial buildings. Upon closer inspection it appears to be a sticker as opposed to sprayed on. Despite this, I love the simplicity of it and the way it brightens up a rather drab bit of construction. This is very cool Brett!! I always enjoy seeing interesting pieces of art, but rarely have the eye to catch them in random public place. Pingback: Hamstaa! 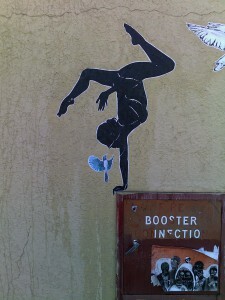 » Can Graffiti add character in a good way?